Want to be involved in Garden Party - our annual free event! We are looking for friendly, reliable and attentive individuals who enjoy communicating with different people and ensuring a great experience for all involved. Whether you are on or off site, you must be alert to health and safety issues. Volunteering is a great way to make new friends and contacts, develop skills, get experience and increase self-confidence, plus you know your are helping to make Trinity the rich, vibrant place that it is. Rewards for regular stewards include guest list access to events of your choice at Trinity – subject to availability. We welcome applications from all backgrounds and aim to be as inclusive as possible, working to accommodate all access requirements. 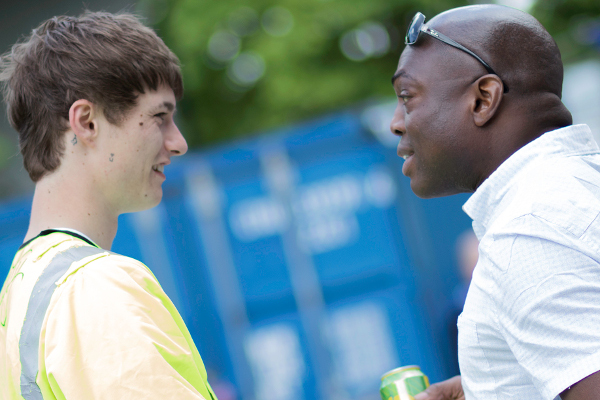 Trinity is committed to making volunteering accessible to all, regardless of income. We reimburse up to £5 towards lunch expenses, travel or, other reasonable expenses. If you are interested in volunteering please fill in an volunteer registration form and send it to darcy@3ca.org.uk. If you have any questions about volunteering contact Darcy via email (above) for more information.